Once regarded as one of the greatest American poets, Jeffers is largely forgotten by the literary establishment today, no doubt because of his politically incorrect subjects and views. A Nietzschean who was accused of fascist sympathies (which he denied), he celebrated nature and the outdoors in his work, eschewing the abstruse modernist style that was fashionable in his day. He opposed the entry of the United States into the Second World War, and published a poem toward this end, “A Day is a Poem ,” in 1941. His 1948 volume, The Double Axe and Other Poems , is filled with criticisms of the US and its actions and policies, and the publisher insisted on excising ten of the more controversial poems from the book, which were only published posthumously. Although the Second World War particularly inspired his ire, he had always been critical of America, which he had already accused of slipping “into the mould of its vulgarity, heavily thickening to empire” in his 1923 poem, “Shine, Perishing Republic .” He continued to write after 1948, but as a result of the controversy surrounding his politics, his work declined into obscurity throughout the remaining years of his life, and remains so today. 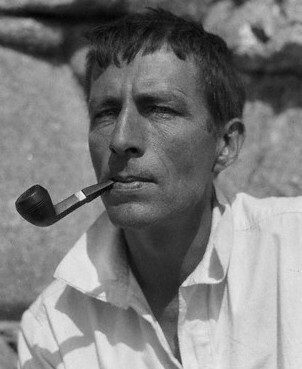 Jonathan Bowden was particularly enamored of Jeffers, and in 2007 he gave a lecture entitled “Robinson Jeffers: Misanthrope Extraordinaire,”  the text and audio of which is available on this site, here . Bowden also spoke about Jeffers during the last interview he gave before his untimely death, which was given to Counter-Currents Radio; the text and audio can be accessed here . Robinson Jeffers Reads “The Bloody Sire”  (video). In spite of his obscurity, Jeffers does retain a following, and many of his works can be found at Amazon , both new and used.